My head was the stage…. Tuesday night/Wednesday morning, I was awakened by Jeremiah who couldn’t sleep. He tried to crawl in bed with us but we were too hot, then he was suddenly “choking to death” by having to sleep on my arm, and he needed a pillow. I told him to go get one. He came back with a stuffed animal, that he proceeded to play with on. my. head. at 2:40 in the morning. Needless to say, I was not pleased. After explaining to him that it is not cool, not even remotely cool…. to play with stuffed animals on your mother’s head at 3 in the morning…. he went and got his blanket and chilled on the floor, where he eventually fell back asleep and I nearly tripped on him when I got out of bed a few hours later. The kids coming into the bed with us, usually in the middle of the night, is not an uncommon occurrence. Especially when they are younger. When I tell folks this, the conversation eventually leads to co-sleeping, and co-sleeping is one of those crazy subjects people love to fight about. I don’t want to fight about it, that isn’t the point of this post…. The point of it was to tell you the ridiculous thing that Jeremiah did at 3 a.m., not to start a war about co-sleeping. I don’t think I would classify myself as a co-sleeping parent of the militant variety. You know the ones that say it is the only way to go… the ones that make people feel like they have sinned against nature by placing their child in a crib. I would classify myself as a co-sleeping parent who does it for much more practical reasons, like….. sleep. Reason 1: It is pickin’ cold when you get up at 3 am to feed a baby. If the baby is with you, there is no need to freeze for either you or the baby. Reason 2:I value my sleep. Getting up in the middle of the night is not my idea of fun. At. All. … As my children get older, if they come and climb in bed with me, I don’t have to get out of bed to shush them back to sleep. It is a win, win. They are comforted, I get to stay in bed. That pretty much sums it up. I like sleep. If sleeping with my kids helps them and me sleep. I vote YES for it. Now all I need to figure out is how to keep them from having puppet shows on my skull at 3 a.m.
this article was written as a part of The Christian Home. If you are interested in writing for this blog carnival, please visit The Legacy of Home to find out how to submit your post. For more great articles this week please visit Day by Day in Our World. Public Service announcement: Thanksgiving is Thursday. (Just incase you forgot.) P.S. You should start thawing your Turkey now. For those of us in the USA our Thanksgiving is just a few days away. I challenge you, on this day of thanks to take the time to BE thankful. Often we are caught up in the hustle and bustle of cooking the meal, or preparing for the sales the next day…. and we forget to pause and notice the things we are truly thankful for. Last year we were in New York City for Thanksgiving Day. We started the day with a parade, and we ended it in a little restaurant, on the top floor. As the day faded, and our weariness was lifted by a good meal and the ability to SIT. We went around the table and we shared some of the things we were thankful for. It was an amazingly special ending to the day. I challenge you to start now, thinking of the things your are thankful for. Maybe encourage your family members to do the same and when you come together as a family, via Skype, or in the living room…..Sit awhile, share with each other the things that you are grateful for and begin a new tradition in the years to come. The crawl in bed with mommy and daddy kind. The snuggle up while you watch a movie kind. Yes, even the knee in the middle of your back in the middle of the night kind. The deep belly laughs. The chuckles. The merry sound of little hearts when they dance around the kitchen on the tops of your feet. Remember the sweet smell of your babies head as they slept on your chest? Remember the giggles that came when you played Peek-a-boo? Enjoy the little moments today….. the dishes will still be there tomorrow. Snuggles and Giggles are simply just……. some of the best stuff on earth. This morning, I got up a bit late to drive my older two to their classes. I ended up in one of the hippest outfits I have ever created, unintentionally of course. It was freezing this morning so upon rising, I pulled on my teal robe and in the dark groped for a pair of sweats. Seizing a familiar material I put them on and padded over to the closet and put on my slippers; headed for the hall closet to get my overcoat. …….Then I looked down. My pants were purple…. not to mention my hair was standing out at weird angles and my eye make up from last night sort of made me look like the guy from Alice in Chains. Trust me when I tell you that my fuzzy cuffed gloves just made the outfit! ….but isn’t that sort of what mommy hood is like? Getting the job done, thinking you have it all together, and then wham, you look down and you are wearing purple pants. Life is unexpected, it happens. We can freak out, or roll with it. Today, I laughed it off…. Joked with my hubby when he came out and met me at the coffee pot. I told him I was HAWT. (more the sweaty pre-menopausal kind, and much less the next top model kind.) He tried to say smokin’ hawt with a straight face….. he “lost it” in gales of laughter before he could get the sssss out. Some days I don’t laugh it off so well. I get hurt. I take it personally when an expectation I had was not met. Sometimes I wrestle with feeling like a failure. Just as my purple pants outfit was not an accurate reflection of who I am, neither are these thought that sometimes capture me. Jesus tells us to cast all our cares upon Him. Some times I need some purple pants moments to remember where I need to focus. I need to not sweat the small stuff, and just keep focused on the task. I need to spend time with Jesus each day and set my thoughts to who He says I am. I am His daughter, a princess, an heir thru grace…. Today we went to the library, it was having one of those quarterly book sales where they sell books at a ridiculous price of $0.25. I never have been able to resist 25 cent books. Among the piles I found a treasure. One I had read long ago and despite the 1970’s cover art, is still relevant today. I grabbed it, knowing it was a gem and would refer to it often. 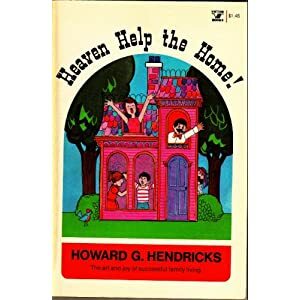 Heaven Help the Home! by Howard G. Hendricks is very worth your time if you happen across a copy. I was flipping through looking for something to jump out at me, and I stumbled upon this passage. “My friend’s experience forces a question: how can you communicate convictions to your children in such a way that those conviction become not simply second hand ( as with my nurse friend) but their personal property (as with Joseph)? I would like to stand here before you and tell you I have this part all figured out. I would say that up until a few months ago, I thought I had a fairly good handle on it. I mean we homeschool right? so, really what big things do we have to worry about….?? The heart of a child belongs to that child. As I am given free will, so are my children. My job is to grow them up in an environment that is honoring to God, to teach, to train, to be intentional. To impress upon them the need for developing a relationship with God, for themselves. Sit with your spouse. Plan. Discuss. Start young. Stay consistent. Above all Pray separately, and as a couple. Pray for your children. That they would remain humble before God as they grow into the teen years and beyond. Have you ever had to give yourself a TIME OUT? Right now, as I type, I can feel my blood pressure rising. I have a deadline, and I have already missed it. Kids are running around an being kids behind me….. Nothing great or chaotic, just normal boy kid noise. I am not feeling particularly patient with it this evening. I need quiet. Solitude even. Every-so-often, I get thoughtful, almost morose. I feel like I have no joy, nothing left to give. Empty. I know I can’t be the only parent that feels this way from time to time. Maybe it is the endlessly mundane chores that go along with motherhood, maybe it’s the lack of recognition….. I mean, that’s what the world around me says. Still, when I am like this, I know I need to turn to God. I am empty because I haven’t been focusing on Him, I have drifted away. I feel like I have nothing left to give because I haven’t spent still, quiet, intimate time with my King. I encourage you friend, when you feel overwhelmed by the mundane, under-appreciated, all around sort of blah….. to spend time curled up with Jesus. Read the Good Book, which is so much more than a good book, it is nourishment for a weary soul. Sometimes, it just must be done. We must leave our children home, with capable care… and be ALONE. We need to remember what it is like to eat and cut our own food, without cutting up food for 3 other people first. We need to practice being able to eat a full meal without getting up to get a spoon, some water, or seconds for someone before we have eaten three bites. We need to talk to each other with out hearing the interruptions of “mamma?” and “daaaad?” as soon as we have gotten 3 sentences out. We need to hold hands, kiss on a moonlit night as we walk across the parking lot to the movies, and we need to take time to be silly with each other. Remember how much fun it was to date? I know times are tight but we can find creative ways to spend time with each other without breaking the budget. Here are some ideas: For babysitting, swap time with another family…. they probably need time away just as much as you do. Swap kids once a month and give each other the night off. Go stargazing. Drop the kids at a friends house and come home to watch a movie and make popcorn. Take a sunset walk. Go to a park and swing on the swings…. Be creative! Sometimes the best thing to do to help you be a great parent, is to invest in some time with your spouse, setting aside your mom and dad hats, and just enjoy some grown up time. this article was written as a part of The Christian Home. If you are interested in writing for this blog carnival, please visit The Legacy of Home to find out how to submit your post. For more great articles this week please visit A Day in the Life. I read a very interesting article this week. Exposing the Major Blind Spots of Homeschoolers was written by a homeschooling father, Reb Bradley, and was originally published in the Virginia Home Educators Magazine. I found it on Joshharris.com. While I agree that some points in his article are particular mine fields for homeschoolers, I feel that this article should be read by parents everywhere regardless of where their children are educated…. If we are being honest we would acknowledge that all parents have blind spots. It is good to face them, self evaluate and ask God to reveal to us the areas we need to work on. In the weeks to come I may take the points of Mr. Bradley’s article and pick them apart within my own personal experience. I don’t know…. I do know it has caused me to think deeply on this subject for the past few days. Most people have a preconceived notion of why people educate at home. I don’t feel like all of the above reasons are bad things, in and of themselves. I know many parents who educate through the public or private systems that want to build up their family, shelter, and discipline their children. The problem arises when we elevate any one of them above our God. Those who have the most power to influence our hearts are those to whom we are drawn: those who succeed with our values (which is what a hero is), those who can benefit us, those who make us feel valuable, and those who have earned our respect. If our children grow up motivated only by fear of consequence, they will eventually get away with what they can whenever we are not around (Eph 6:6). If we have their hearts they will seek to honor us whether we are present or not, and their hearts will remain open to our influence. I refer you to the apostle Paul who modeled this approach to leadership perfectly, “Therefore, although in Christ I could be bold and order you to do what you ought to do, yet I appeal to you on the basis of love…” (Phile 1:8-9a). Paul’s pattern with the churches suggests he understood that appeals to love were more powerful than commands and threats. These closing words have been where I have stood evaluating. Am I drawing my children to me, or repelling them with my behavior? Am I winning their hearts? Have I led in a manner that earns their respect? I do not want to make my home a child centered home, catering to their every whim and desire, with no discipline or structure, but I do want to disciple my children’s hearts. Pointing them to the Lord whenever possible, modeling grace, humility and love. I invite you to read Exposing the Major Blind Spots of Homeschooling by Reb Bradley for yourself. I hope you will prayerfully consider what it may reveal to you. I would love to hear what your thoughts are after reading it. this article was written as a part of The Christian Home. If you are interested in writing for these blog carnival, please visit The Legacy of Home to find out how to submit your post. To read more of this week’s publication visit A day in the Life. All of these statements eventually lead to the ultimate equality card being pulled out and slammed into the argument……………. “it’s not fair?!! ?” (can you hear the whine?) How many times have you heard that as a parent? Even if I were paid only in nickels, for each time a child used that as a opening argument,….. I would be able to retire to beach front property, …a year ago. So what do you do when you hear that statement?? I will admit, that not long ago, my pithy response was “Fair? you want fair?? The Fair is where you take a prize pig…and a pumpkin pie…” You see, I didn’t put much stock in this whining about things being fair. My overall attitude was “get over it kid.” I was beginning to see that my response to them, left them without some sort of resolution. It lacked any teaching, molding, shaping….. there was no discipleship in it. While I still have the “get over it” mentality from time to time, God is gracious with me and is working in my heart. He is showing me what He says about fairness, and the arguments that start when one kid wants the other ones toy and screams “its not FAIR!!”…. to try to get the toy that belonged to someone else in the first place. I am beginning to realize that this need for “fairness” stems from selfishness really, and that while my pithy response gets laughs…. it does nothing to train my children to begin to see why they fight, why they want their own way, and what God’s Word has to say about it. My husband summarizes this as the “We want what we want when we want it” passage of the Bible. James is telling us that we have desires…. we desire for things to be fair, especially when our perception of *fair* is in our favor. I have found that using Scripture to ask questions, to engage my children’s minds and hearts, has been a factor in increasing the peace with in our home. I want the Bible to be so much more than a collection of stories to them. More than a set of rules they feel they can not measure up to. I want it to be relevant in their day to day lives. Used as a filter, where they can confidently say…. Oh, I can change that, and here is how, this verse right here tells me how. I pray that God will use each of you as ministers of grace and love to your families, this week, see you soon! I hope you enjoyed this contribution to The Christian Home weekly magazine. You can read all of this week’s great articles Here. They will inspire you, encourage you, and just plain make you smile. If you are interested in writing for this Magazine, please visit The Legacy of Home, to learn how to submit your article.